Click here to open the CAPS guidebook. We have an extensive area on our website, starting on this page about CAPS syndromes, and also a medical guidebook on this disease for download on our site in English, or in Spanish. A detailed page on CAPS genetics, and one on FDA-approved CAPS treatments are also on our site. Helpful research articles are at this link. More studies on updated research-based effective treatment options are here. 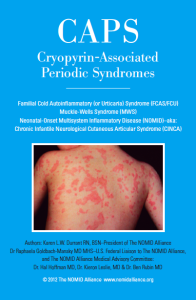 Click here for a general list of Cryopryin-associated periodic syndromes research and information.